We are Carioca Capoeira in Baltimore. It is lead by Instructor Onça. Capoeira is the Afro-Brazilian martial art that takes its roots during the colonial era of Brazil. 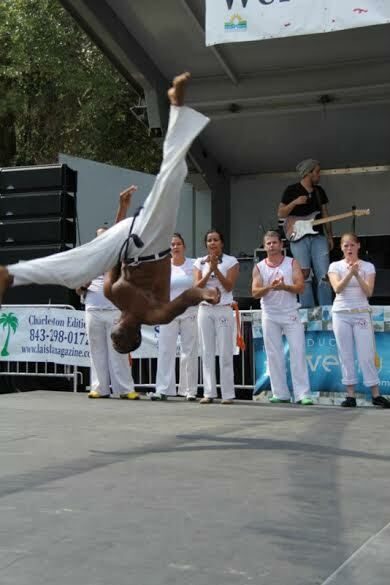 Capoeira combines music, dance, acrobatics, play and martial elements into a dynamic ritual fight. The details of capoeira’s origins and early history are still a matter of debate among historians, but it is clear that African slaves played a crucial role in the development of the art form. Capoeira differs from other Martial Arts because of the strong African and Brazilian components: the rhythm of the music, the call and response of the songs, and the Ginga, the mobile guard of Capoeira that resembles dance steps. Capoeira is a delightful sight, fun, relaxing, and empowering. Capoeira is an energetic, the game or dance, played in a circle with musical accompaniment, in which two players try to take each other down, or otherwise dominate each other, whilst showing a mastery of movement. The players evade touching any part of the body to the ground excluding the hands, feet, and head. Becoming skilled demands long-term training. Full involvement requires learning how to play instruments, as well as learning the necessary movement skills. A great body, strong lean muscles, and unshakeable confidence are just some of the results you’ll see training capoeira. Capoeira classes offer a high-energy workout that melts fat and works every muscle in your body. It’s a great workout, but that’s just the beginning. You get to learn another culture, language, and the rich history of Capoeira becoming part of the continuing tradition. Capoeira is also a lot of fun! Actually enjoying your workout is key to getting the most out of it and sticking with it. This isn’t just a group of people standing around kicking a bag or dancing to music. You’re constantly learning new things and challenging yourself in new and exciting ways. You’ll see real progress and will never get bored. And most important, it’s for everyone! How would that make a difference in your work, social, and family life? 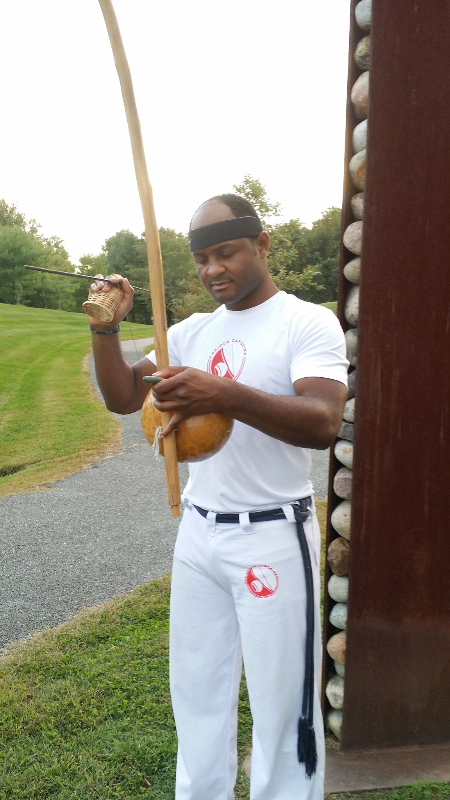 This Afro-Brazilian Martial Art will help others to gain control of their own body. You will be amazed at what you can get your body to do. Gaining control of your own body is a big part of developing unshakeable confidence that will impact all other areas of your life. The music which accompanies Capoeira is an essential element in the practice. The music provides the rhythm and the beat to which the opponents perform to, and is just as important as the opponents themselves. Some of the players will take their instruments and sing around the edge of the ring (the roda), fashioning a musical setting for the two players involved in the physical competition within. It has been suggested that the player’s form a circle to enclose the game was to screen the competition from the persecuting authorities. There are several instruments essential to the music; the berimbau, a single-stringed, gourd-resonating musical bow, leads the Capoeira band. Other instruments include an atabaque, a tall, cylindrical, single-faced drum; pandeiros, tambourine-like frame drums; a double bell-gong called an ago-go; and a ‘reco-reco’, a type of scraper typically made of wood. If one is not proficient in these instruments, then the term ‘capenga’, which translates as ‘lame’, is applied to that individual. The berimbau is considered the most important instrument in the roda. The instruments is generally believed to originate in southern Africa or Angola, and then modified to suit the needs of the musicians on arrival in Brazil. The bow of the berimbau is shaped from the flexible trunk of a small biriba tree or another hardwood and preferably strung with a steel belt. A hard-shelled gourd, called a cabaca, is attached to one end of the bow. The musician hits the bow with a stick. To then modify the tone the musician takes a large metal coin or smooth stone and presses it against the string. From this method, the musician can create three separate tones: a low open note, a higher-pitched, and a buzzing, intermediate gray tone. In some cases, just carrying the instrument was enough to get the carrier arrested in the times when Capoeira was illegal. Singing is seen as totally fundamental to the achievement by many players, and in some cases no physical play can occur without a sung invocation. In a few cases there are verbal contests, or singing duels, that intimately parallel the physical challenges between players. The formal verbal contest is a widespread custom in many Afro-Brazilian genres besides Capoeira. 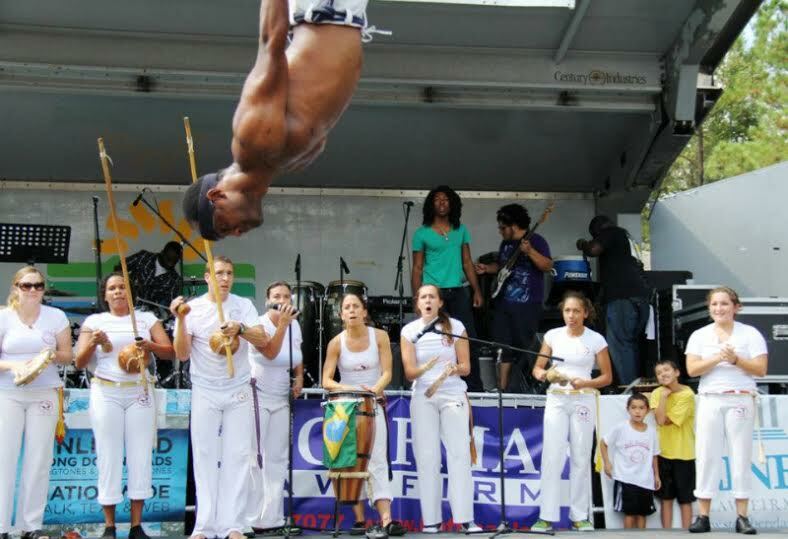 The music is an integral part in Capoeira. Disruptions in the instrumental music, however, even a backing instrument which is played out of rhythm or a string breaking on a musical bow, can bring the players’ in the middle of the roda to an immediate standstill. It is said by players that the music of Capoeira can draw the past into the present. Perhaps it is this, this connection with the past, which the players of Capoeira still love to perform the dance and the music. Training Capoeira will help you in every area of your life. You will get stronger, more flexible and gain agility. But those are just the physical benefits of training Capoeira. Capoeira will also help you to gain more confidence, learn about another culture, introduce you to people from all different types of backgrounds, and give you a community of people who will help you to stay motivated to train….and training will improve your health. In this day and age, health is a concern for all of us as we age. In Brazil, it is normal to see people who train Capoeira into their 80s and 90s. It is a life-long practice that keeps you young physically…and young at heart as well. We believe that training Capoeira greatly improves the lives of all who train it. Not only will it improve your quality of life, by becoming a part of our Capoeria community you will help to improve the lives of all members of our community. Every member of our group brings their energy to the group, which helps us grow stronger together. Without our group, we do not have Capoeira…which means that each and every member is important to our overall growth. You can see this way of thinking in everyday life in Brazil…community is very important. Since martial arts tend to reflect the culture that they come from, the Capoeira Community is an essential part of our joint progress in learning this dynamic art form. We need you to be a part of our group! Capoeira is much more than just another martial art or workout class. It is a community, a family and a way of life that will improve your health, help you to reduce stress, and help you meet new people. You will have opportunities to travel and meet people from every walk of life…this, in turn, will help you to get to know yourself better as well. Capoeira is a community where all would be welcome…a place where I could raise my children and prepare them for life. A family. My son Daryl Jr. is a strong, very social, happy, well-adjusted child…I am grateful to our Capoeira Community for helping me raise my son in a positive and healthy environment. As parents we want to help our children grow, learn and develop. We want our children to gain experiences that will help them become productive members of society. Our goal is to help provide your child an environment where they can flourish and grow. Join our community and know that we will help your child develop healthy habits, gain confidence and self-assurance, as well as to make lasting friendships. Every parent wants their child to grow up healthy and happy. We see Capoeira as a tool to create stronger, healthier, happier people. Training Capoeira will help your child develop healthy habits as they train and become more fit, flexible, stronger, and overall healthy. Try our Intro Program to see what Capoeira can do to help your child develop these healthy habits early in life. Get your child used to working out on a regular basis. We all know that kids who exercise do better in school, have fewer problems, release stress in a positive way, and are more confident and focused. Training Capoeira is challenging. It requires a lot of focus and energy. Children who train Capoeira learn how to listen better, focus more and in turn become more confident as they learn the challenging movements of Capoeira. This focus will translate into every area of their life: school, home, friends, and community. Capoeira was created by African slaves who were taken to Brazil to work. Oftentimes, the slaves were from different tribes, backgrounds and often spoke different languages. Capoeira became a way that the slaves became united, learned about each other, built a community, trained their bodies for self-defense, and escaped from slavery…emotionally, mentally, and oftentimes physically. Today, Capoeira still brings people of all backgrounds and walks of life together. In our community, your child will meet people from many backgrounds, of all ages, who each contribute to our community. Your child will meet other children who are unique and talented. Training Capoeira will help your child learn more about the world they live in. Your child will learn a new culture, music, acrobatics, martial arts, dance, Portuguese language, and how to deal with all types of people in a positive manner. In a world full of violence, crime and negativity, our community will help provide your child a place to learn positive lessons and make many lifelong friends. Kids love Capoeira because it incorporates what they like. Martial Arts. Dance. Music. Acrobatics. Most kids want to do all of these activities. Most parents do not want to take their kids to do all of these classes! Training Capoeira will give your child everything that they want…all under one roof which is convenient for you as a parent. Is your child always bouncing of the walls? We love energetic kids because they get the most out of Capoeira. You need refreshingly little to start Capoeira. As a beginner, you could wear sweat pants or loose bottoms and a T-shirt. If you attend regular, you would then get the group uniforms (abadas, cord, and class shirt). You can go barefoot, or wear nonslip lightweight shoes, such as those designed for pilates or other low-impact indoor workouts. Capoeira class is usually 1-2 hours of class. The first 10-15 minutes is dedicated to static stretching to warm up to enable the blood flow to increase in your muscles. Next 30-45 minutes will focus on conditioning and the fundamental movements of capoeira, kicks, dodges, and light acrobatics. Then, there would be a 10-30 minutes of a “roda," the circle of people within which Capoeira is played. People who make up the roda’s circular shape clap and sing along to the music being played for the two partners engaged in a Capoeira “game” (jogo). The game is a corporal conversation between 2 people. During the game, players do not focus on injuring the opponent. Rather, it emphasizes more skill. Lastly, we will focus on the history and language of the art. What can I expect at the intro class? At your first class we will do a warm up and stretch with the whole group during 15 min, the rest of the time you will be taught the very basics of Capoeira, this way you will leave with a basic understanding of proper technique for the fundamental Capoeira movements. The series provides an excellent foundation for entering our regular, ongoing classes and an introduction to the art, music and history of capoeira.